The number of stars appearing on the obverse is a particularly interesting feature of the series, especially in 1797 when three different counts were used. The first variety has fifteen stars, the second sixteen, and the last thirteen stars. The fifteen and sixteen star counts represent the number of States in the Union at the time of mintage. It was soon realized that the Mint could not indefinitely add stars to the design, especially on the small diameter of the half dime. Therefore, it was decided that the number of stars would revert to thirteen, to represent the original number of states in the Union. 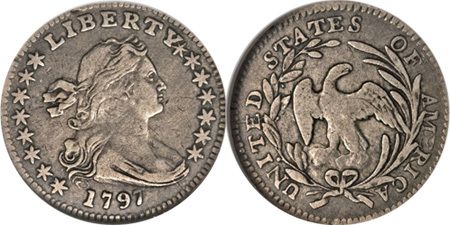 The 1797 “13 Stars” Draped Bust Half Dime represents the scarcest of the three varieties, produced just before the denomination was halted. Very few examples have survived, with the majority well circulated and only the distinct minority in uncirculated grades. The finest known is a single gem example graded MS-65, which mysteriously survived the test of time. It sold for $402,500 in 2008, and also represents one of the finest examples of the small eagle reverse subtype.